Fairfield's Bennett Hodson, left, and Brandtson Duffie compete in the 800m run. 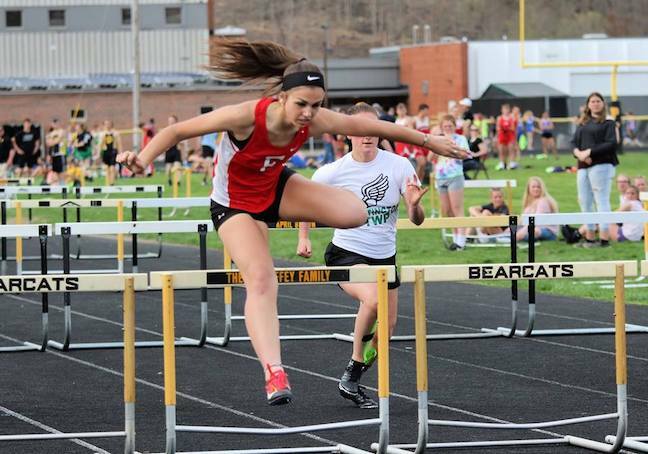 The Fairfield Lions and Whiteoak Wildcats boys and girls track & field teams competed in the 2019 Andy Haines Invitational hosted by Paint Valley High School on Thursday, April 11, where the Lions broke multiple school records. In the event itself, the Lions boys team placed fourth overall with a score of 57, while the Lady Lions were also fourth place with a score of 77.50. The Whiteoak boys team placed 12th overall with 24 points, and the Lady Wildcats were 10th with 18 points. For the Lions, the boys 4x400-meter relay team of Bennett Hodson, Gavin Campbell, Wyatt Fent and Brandtson Duffie had a time of 3:36.91, surpassing the old mark by three seconds. Other new school records set by Fairfield included the girls 100m hurdles mark now held by Ailean Duffie at 17.99, and the girls 4x200m relay mark is now held by Mikayla Griffith, Payton Harvey, Paige Teeters and Duffie with a time of 1:56.84. There was also a new girls pole vault record set by Sammi Shepherd at 6-06.00. Other first-place times for the Lions included Duffie in the 800m run with a first-place time of 2:00.02. In the 3200m run, Fairfield’s Cohen Frost was first place at 10:41.78. Ciara Colwell of Fairfield was the winner of the 1600m run at 5:56.99. Colwell also won the 3200m run with a time of 12:49.26. Whiteoak’s Kensley Bailey was first place in the long jump at 15-09.50. • 4x800m relay — 5, FHS (Riley Friend, Brant Haines, Blake Haines, Reese Teeters), 10:07.16; 6, WHS (Robbie Raines, Gabe Sheppard, Zach DeAtley, Atlee Carr), 10:09.60. • 110m hurdles — 9, Taylor Newton (WHS), 20.13; 19, Ryan Benson (FHS), 25.22. • 100m dash — 8, Wyatt Fent (FHS), 12.10; 13, Bryce Posey (FHS), 12.64; 18, Colton Grosvenor (WHS), 13.67; 22, Trevor Hoop (WHS), 14.89. • 4x200m relay — 7, WHS (Jacob Campbell, Taylor Newton, Colton Grosvenor, Bryce Bailey), 1:42.40; 8, FHS (Bryce Posey, Austin Lovitt, Wyatt Fent, Ethan Saunders), 1:45.25. • 1600m run — 2, Ethan Davis (FHS), 4:51.19; 3, Hunter Morgan (WHS), 4:53.72; 8, Blake Haines (FHS), 5:12.78; 11, Zach DeAtley (WHS), 5:32.09. • 4x100m relay — 9, FHS (Bryce Posey, Ethan Saunders, Austin Lovitt, Wyatt Fent), 49.28; 11, WHS (Jacob Campbell, Taylor Newton, Colton Grosvenor, Bryce Bailey), 49.94. • 400m dash — 8, Gavin Campbell (FHS), 55.96; 12, Jacob Campbell (WHS), 58.93; 14, Taylor Newton (WHS), 59.85; 21, Brant Haines (FHS), 1:09.91. • 300m hurdles — 14, Reese Teeters (FHS), 52.27. • 800m run — 1, Brandtson Duffie (FHS), 2:00.02; 2, Bennett Hodson (FHS), 2:03.02; 10, Atlee Carr (WHS), 2:17.82; 14, Robbie Raines (WHS), 2:25.35). • 200m dash — 8, Bryce Bailey (WHS), 24.51; 18, Austin Lovitt (FHS), 20.03; 21, Ben Elton (FHS), 30.53. 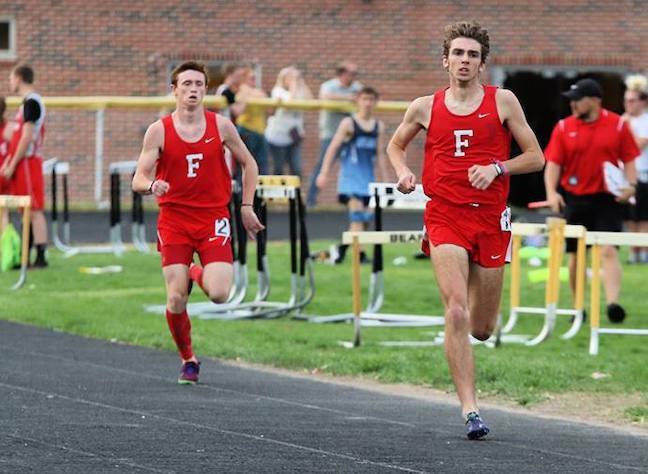 • 3200m run — 1, Cohen Frost (FHS), 10:41.78; 2, Hunter Morgan (WHS), 10:43.69; 12, Riley Friend (FHS), 12:09.26. • 4x400m relay — 2, FHS (Bennett Hodson, Gavin Campbell, Wyatt Fent, Brandtson Duffie), 3:36.91; 12, WHS (Gabe Sheppard, James Taylor, Joseph Taylor, Colton Grosvenor), 4:47.53. • Discus — 12, Ethan Whalen (FHS), 92-02; 14, Atlee Carr (WHS), 86-06; 21, Tucker Green (FHS), 70-06; 24, Ryan Farahay (WHS), 55-03. • High Jump — None. • Long Jump — 5, Bryce Bailey (WHS), 18-01.25; 19, Skylar Lightner (WHS), 13-06.75; 20, Riley Friend (FHS), 12-02.50. • Shot Put — 9, Ethan Whalen (FHS), 36-10.00; 16, Tristan Mick (WHS), 30-10.00; 21, Corey Allen (FHS), 25-09.50; 24, Brayden Houpe (WHS), 22-08.25. • Pole Vault — 4, Ethan Saunders (FHS), 10-06.00. • 4x800m relay — 4, FHS (Morgan Richmond, Sammi Shepherd, Emily Price, Ciara Colwell), 11:53.89. • 100m hurdles — 2, Ailean Duffie (FHS), 17.99; 10, Audra Greiner (FHS), 19.74; 18, Rachel Rudy (WHS), 22.69. • 100m dash — 5, Caitlin Campbell (FHS), 14.23; 6, Autumn Avedisian (FHS), 14.23; 21, Summer Brown (WHS), 16.16. • 4x200m relay — 3, FHS (Mikayla Griffith, Payton Harvey, Paige Teeters, Ailean Duffie), 1:56.84. • 1600m run — 1, Ciara Colwell (FHS), 5:56.99; 6, Anna Davis (FHS), 6:40.08. • 4x100m relay — 10, FHS (Hailey Daniels, Katie Buddelmeyer, Maddie Griffith, Jami Dailey), 1:00.11. • 400m dash — 12, Jami Daiely (FHS), 1:15.75. • 300m hurdles — 6, Ailean Duffie (FHS), 56.77; 7, Audra Greiner (FHS), 56.95; 14, Rachel Rudy (WHS), 1:05.16; 15, Morgan Evans (WHS), 1:07.49. • 800m run — 3, Morgan Richmond (FHS), 2:47.48; 13, Makenna Colwell (FHS), 3:21.90. • 200m dash — 2, Kensley Bailey (WHS), 27.97; 4, Caitlin Campbell (FHS), 28.74; 11, Jordan Griggs (WHS), 31.15. • 3200m run — 1, Ciara Colwell (FHS), 12:49.26. • 4x400m relay — 3, FHS (Mikayla Griffith, Payton Harvey, Paige Teeters, Morgan Richmond), 4:39.21. • Discus — 13, Hannah Hodson (FHS), 62-03; 15, Grace Buchanan (FHS), 59-07; 17, Jeanette Cox (WHS), 58-09; 21, Sierra Hoop (WHS), 47-02. • High Jump — 7, Sammi Shepherd (FHS), 4-04.00. • Long Jump — 1, Kensley Bailey (WHS), 15-09.50; 12, Paige Teeters (FHS), 13-03.50; 16, Mikayla Griffith (FHS), 11-07.75; 19, Summer Brown (WHS), 11-00.50. • Shot Put — 8, Shaleigh Duncan (FHS), 24-11.25; 13, Cora Gillespie (WHS), 23-07.75; 18, Saylor Priest (FHS), 21-11.00; 19, Morgan Evans (WHS), 20-06.75. • Pole Vault — 5, Sammi Shepherd (FHS), 6-06.00.